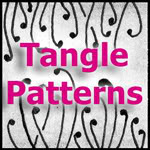 Another month has gone by and we are trying a tangle by Maria Vennekens - named sankegg for The Diva's Challenge. I found it a bit tricky, my sankegg turned out a bit more like sails on a lake. this is lovely, shelly. Love the way it merges with the border pattern. I found this challenge very difficult. I was wondering how will you merge Tripoli with Sankegg and ,as ever ,it's perfect.Love the dash of green. Very clever! 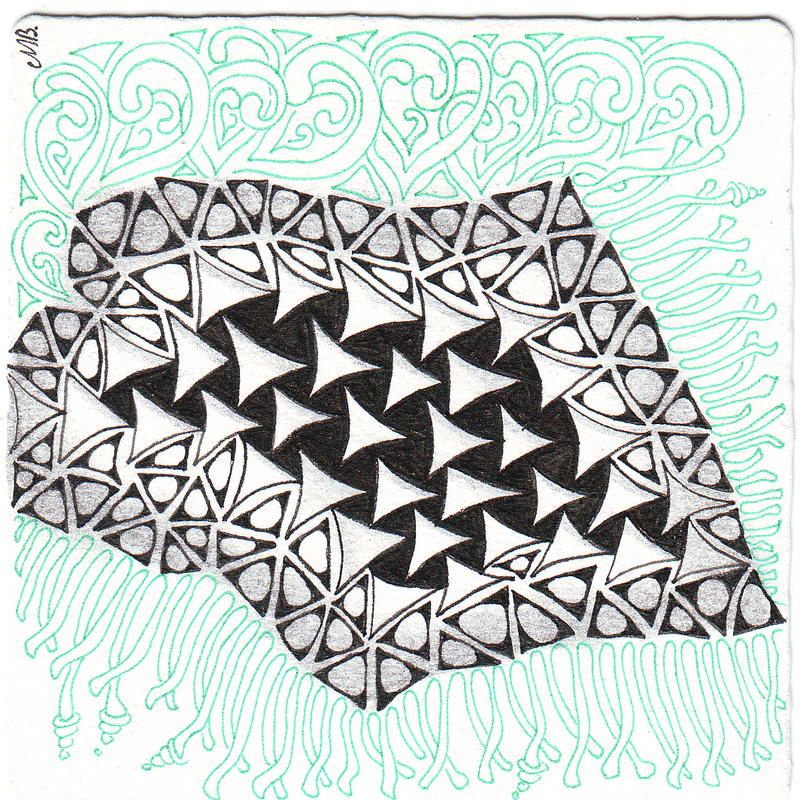 I love the merging of the triangle tangles and the tangly green border. I love your sails on this lake! And what could be more beautiful than sails on a lake? Sankegg in all its glory....I have never seen tripoli in a better light than this challenge. I have now seen it twice and it is fantastic in both pieces. I would say blue on the outside...the mooka is a bit like waves...and I love the whole piece! i like the way it stands out against the black backdrop! Super tile with tripoli which has been merged so well into it. I think its rather pretty. You do one heck of a lovely Mooka! Beautiful as always! I love the green, especially your lovely mooka! I love this, your sails on the lake are lovely and lyrical! I agree with everyone else. I couldn't wait to see what you did with this since it seems so far out of your usual style. Love it. There is always so much to look at in your art. 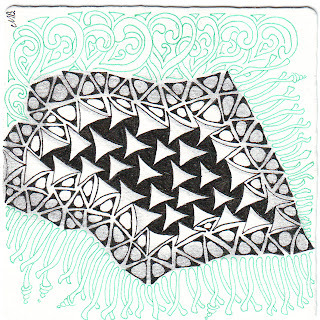 At first, I didn't even see the beautiful green border tangles. I love that. Love the way Sankegg just gracefully finds its way into the Tripoli space. Clever. Love it. 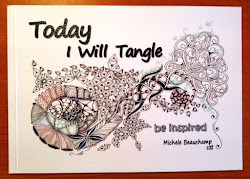 Such great movement from tangle to tangle and the blue/green mooka just makes me swoon! I like the way it turned out, and sails are what it does look like. Nice composition with other patterns and colors, too.